IBM is celebrating the 100th anniversary of its founding Thursday. Led by American capitalist icons Thomas J. Watson, Sr. and Thomas J. Watson, Jr. until the 1970s, the company grew from a pre-World War I conglomeration of companies making tabulating machines and time-keeping devices into a globe-spanning technology behemoth that pioneered the development of electronic computers and dominated the mainframe era. The company holds a mind-boggling array of patents and pioneered advances in a wide range of technologies including punched cards, processors, transistors, storage, word-processing, databases and OSes. As one of the emblematic 20th-century corporations, IBM also went through turbulent times. The U.S. government brought several antitrust lawsuits against the company, and critics have attacked it for alleged cosiness with repressive regimes. After Tom Watson Jr. retired in the 1971, the company seemed to lose its way as mainframe computing began to face competition from smaller, more modular systems. Increasing bureaucracy contributed to missteps during the PC revolution, and IBM suffered a series of annual losses in the early 1990s. Under the reins of then-CEO Lou Gerstner, starting in the mid-90s, the company bounced back to profit by focusing on software, system integration and other services, which remain key to the company's growth today. Though Hewlett-Packard, after its acquisition of Compaq, overtook IBM as the world's largest computer company by annual revenue, IBM's global reach and broad product portfolio still make it one of the largest and most profitable IT companies in the world, with about 427,000 employees and a profit of US$14.8 billion on sales of $99.9 billion last year. The following is a timeline of milestone events in one of the quintessential U.S. corporate success stories. --1889: Time-recording equipment maker Bundy Manufacturing Co. is incorporated. --1896: Punched-card, electric tabulating equipment maker The Tabulating Machine Co. is incorporated. --1911: Incorporation on June 16 of the Computing-Tabulating-Recording Company (C-T-R), which merges Bundy, the Tabulating Machine Co., the Computing Scale Company and the International Time Recording Co. Headed by trust organizer Charles Flint, the company has 1,300 employees. --1914: Thomas J. Watson, Sr., joins C-T-R at age 40, after learning aggressive sales tactics at the National Cash Register Co. that led to his conviction on antitrust charges. The verdict was set aside after an appeal. Within 11 months of joining C-T-R, Watson became its president. His focus on marketing and sales and large-scale tabulating solutions for businesses helped company revenue more than double in his first four years at C-T-R, to $9 million. Over the next four decades as IBM CEO Watson became an American business icon, pioneering worker benefits such as paid vacations and group insurance while instilling discipline and loyalty in generations of IBM workers. --1923: The first electric key punch is introduced, representing an advance on mechanical systems. --1924: Taking the name from a Canadian affiliate, C-T-R formally becomes International Business Machines. --1928: The 80-column IBM punched card, doubling prior capacity, is unveiled and remains a standard for 50 years. IBM's Harvard Mark I was 51 feet long and weighed nearly 5 tons. --1931: A watershed year in advances: IBM 400 accounting machines offer alphabetic data, the 600 series calculating machines perform multiplication and division, and the first automatic multiplying punch and reproducing punch machines are introduced. --1933: IBM acquires Electromatic Typewriters, acquiring entry in the typewriter business, which ultimately leads to innovations in word processing. --1936: Tom Watson, Sr.'s, insistence on making machines during the Depression, even when demand dried up, pays off when IBM is in a position to participate in what was then billed as the biggest accounting operation of all time, supplying punched-card equipment to the U.S. government in the wake of the 1935 Social Security Act. --1937: Tom Watson, Sr., is elected president of the International Chamber of Congress, and at a Berlin meeting promotes "World Peace Through Trade," taken on as a slogan by the ICC and IBM. Germany awards him with an Order of the German Eagle medal. He returns the medal in 1940, enraging the Fascist government, but IBM's business in Germany in the 30s stirs criticism over the years. --1944: IBM's first large-scale computer, the Automatic Sequence Controlled Calculator or the Mark I, is the first machine to accomplish long operations automatically, using electromechanical relays. --1946: IBM's 603 Electronic Multiplier is the first commercially available machine to offer electronic arithmetic circuits. It is more than 50 feet long, eight feet high, and weighs almost five tons. --1948: IBM releases the Selective Sequence Electronic Calculator, a large-scale digital calculating machine that uses electromechanical relays and offers for the first time the ability to modify a stored program. --1952: The IBM 701 is IBM's first production electronic computer, featuring tape-drive technology that ultimately led to the ascendance of magnetic tape. --1952: Thomas J. Watson, Jr., becomes IBM president. He was a force behind the 701, essentially a bet-the-company stance on electronic computers before they became more cost-effective than electromechanical machines, leading the way for IBM to dominate computing for the next few decades during the mainframe era. --1956: Consent decree ends a 1952 U.S. antitrust suit, as IBM adapts a more liberal policy toward licensing equipment. --1956: Tom Watson, Jr., takes over as CEO in May, before the death of his father in June. Tom Jr. moves to reorganize IBM along divisional lines, based on a "line and staff" concept that is adopted by American business at large. 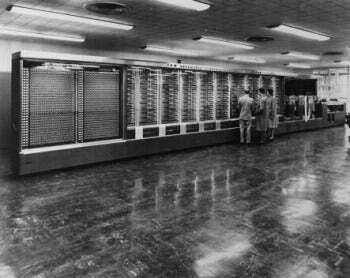 --1957: IBM introduces FORTRAN, which becomes the main language for technical work and is used to this day. 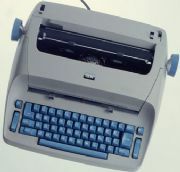 --1961: The Selectric typewriter is released; later models offer memory and give rise to modern word processing. --1964: The IBM System/360 uses Solid Logic Technology microelectronics and introduces the concept of a family of computers that share compatible technology, in what was essentially a $5 billion bet on future trends. ---1966: IBM's Robert Dennard invents the Dynamic Random Access Memory cell, which remains an industry standard. --1969: IBM technology including an onboard computer used in first manned flight to the moon. --1971: Tom Watson Jr. steps down, is succeeded by Frank Cary, and the floppy disk is introduced; it later becomes the PC data storage standard. --1975: The IBM 5100 Portable Computer enters the market, weighing 50 pounds and priced at $9,000 to $20,000. --1981: The IBM Personal Computer becomes the smallest, and at $1,565, the lowest priced PC to date. IBM's deal for Microsoft to supply the operating system and allow competitors to buy it for "IBM-compatible" clones fuels a growing industry and paves the way for competitors such as Dell and Compaq. --1982: A U.S. antitrust suit filed in 1969 is dismissed, but arguably pushes IBM to further separate hardware from software, allowing customers to increasingly mix and match products from different companies, a trend that takes off during the PC era. --1984: The Personal Computer/AT, IBM's second-generation PC, runs on a 6MHz Intel 80286 processor. The ancestor of Watson, the Jeopardy-winning machine. --1987: The IBM Personal System/2 (PS/2) is launched along with the OS/2 operating system, jointly developed by Microsoft and IBM. OS/2 offers multitasking capabilities and in six months one million PS/2s are shipped. But while IBM PC chief James Cannavino wants OS/2 to maintain compatibility with the AT going forward, Bill Gates wants to move on to machines built around the Intel 80386 chip. Windows 3.0, released in 1990, offers crude multitasking features but makes use of '386 memory management and becomes a hit, leaving OS/2 in the dust. --1990: IBM releases the System/390 family, comprising midrange machines and supercomputers, calling it the company's biggest product development in 25 years. New technology includes high-speed fiber optic channels, ultra-dense circuits and extended supercomputer capabilities. --1991: As Microsoft and PC clone makers rake in profits, client/server architecture takes off and IBM shocks long-time industry insiders by announcing an annual loss of $2.82 billion, the first of three annual losses in a row. Under CEO John Akers, IBM considers breaking up into smaller, nimbler companies. --1993: Louis Gerstner, former chief executive of RJR Nabisco, takes the reins as chairman and CEO. At his inaugural press conference, Gerstner plainly states his intention to keep IBM together as an integrated company, and his belief that there is a need for a broad-based IT company that can serve as both supplier and systems integrator to customers. --1995: IBM acquires Lotus Development Corp. and its Notes collaboration software, making IBM the world's largest software company. --1995: IBM introduces the ThinkPad 701cm, which runs on the Intel 133MHz Pentium processor. The sleek black design is a departure for IBM and wins accolades. --1996: IBM's launch of the DB2 Universal Database, capable of querying alphanumeric data as well as images, audio and video, marks IBM's firm embrace of the Internet. --1997: Deep Blue, an IBM RS/6000 SP supercomputer able to calculate 200 million chess positions per second, defeats grandmaster Garry Kasparov. --2001: The publication of Edwin Black's "IBM and the Holocaust" coincides with an Alien Tort Claims Act claim, later dismissed, against IBM for allegedly suppling punched card technology that enabled the Holocaust. IBM's response points out that along with hundreds of foreign-owned companies in Germany at that time, its affiliate came under the control of Nazi authorities prior to World War II. --2002: Sam Palmisano becomes CEO in March, and in July IBM signals it is further strengthening its services business with a $3.5 billion acquisition of the PricewaterhouseCoopers global business and consulting technology unit. --2005: Though IBM has sold more than 20 million ThinkPads, it announces the sale of its PC business to Lenovo in an effort to further focus on software and services. --2011: Watson, comprising 90 IBM Power 750 servers, shows off IBM's artificial intelligence and systems architecture expertise by defeating two Jeopardy game show champions in a two-game match.